The prose of Man, Economy, and Stateby Murray Rothbard is as clear as a bell. But its sheer size (1441 pages!) is intimidating. After all, Rothbard systematically covers the whole of economic science. Fortunately, the young and brilliant economist Robert Murphy has come to the rescue! In writing the Study Guide to Man, Economy, and State, he had his students in mind. He wanted to design a great teaching tool, one that would reach students the same way a private tutor would. He wanted to help Rothbard's magnum opushave permanent impact on their thinking. He accomplished his goal! The guide provides a roadmap to this massive book, complete with summaries, technical notes, annotations of key contributions, and study questions. He puts it all into a manageable size, with 12 pages per chapter of the Scholar's Edition (which includes both Man, Economy, and State and Power and Market). To write a guide of this sort is harder than it looks. Murphy first had to master the material in every way, enough so that he could write short, 3-page summaries of the chapters. He then used his advanced training to discuss and elaborate some of the more technically difficult sections of the book. 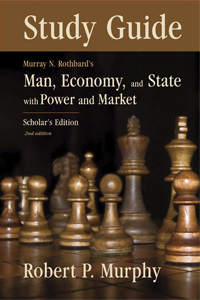 And because Rothbard does not often explain what is innovative in his own theories, Murphy draws attention to the unique contributions to economic science found herein. He tops it off with a series of thought-provoking questions that deal with the core lessons of each chapter. The study guide comes spiral bound for ease of use. Murphy spent more than a year writing and editing this guide. As you will see, he is an excellent teacher and he set out to do this in a way that appeals to students of all ages. One of the goals of the Mises Institute has long been to make this book accessible to everyone, particularly people who are studying economics, and especially those who are interested in Austrian economics. This powerful guide makes the text open up as never before. It is ideal for classroom use, and also for private study. Another use didn't occur to the author until after he finished it: he uses it to prepare lectures for class! He says now that he doesn't know how he taught without it before. Murphy sought to write a teaching guide but he ended up writing a manual to Man, Economy, and State that will quickly become a staple of the literature. Would that every book of this size had such a guide (and, yes, he has now completed one for Human Actiontoo! ), and would that every guide were as clear and useful as this one. Professor Murphy is an extraordinary talent with a great gift for helping students understand economics. Now he can be your teacher too. The chapters of this guide match the twelve of Man, Economy, and State and the seven of Power and Market; appendices are handled within each chapter. A typical chapter begins with a one-page summary, followed by a detailed outline, "contributions" or observations from the author, technical details, and finally, ten study guide questions. "I strongly urge all those who take Austrian economics seriously to read (at least large portions of) Rothbard’s treatise; I would go so far as to say that a modern academic cannot really call him or herself an Austrian economist without doing so. For those who may be intimidated or discouraged by the massive volume, I hope that this study guide will at least “chart the territory” and allow them to begin in those topics that most interest them. At that point, I suspect, Rothbard’s spell will overtake them and they will be compelled to read all 1,441 pages." Rothbard's great treatise and its complementary text combined into a single edition as they were written to be. A model of intellectual combat, page after page of razor-sharp thinking and crystal-clear prose. Rothbard's great treatise and its complementary text combined into a single pocket edition!